There should be always things in stored in our house which are basic utilities so that at some emergency situations we do not get short on them. When the impromptu guests arrive at home we need many things to host them properly and nicely so that they feel completely comfortable at your home. So, things like grocery, toiletries, and beverage bottles all should be present in your house already so that the guests do not feel any kind of inconvenience. 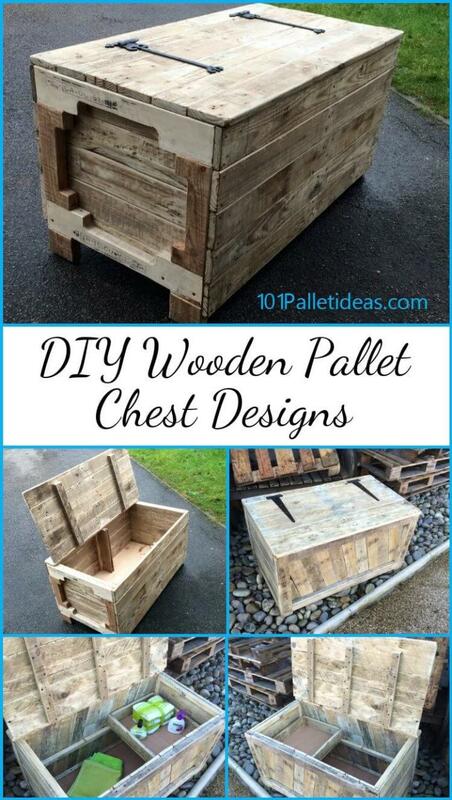 And for the storage of such things in advance you must have a storage item and these DIY pallet chest designs would proudly perform this storage task at your home. 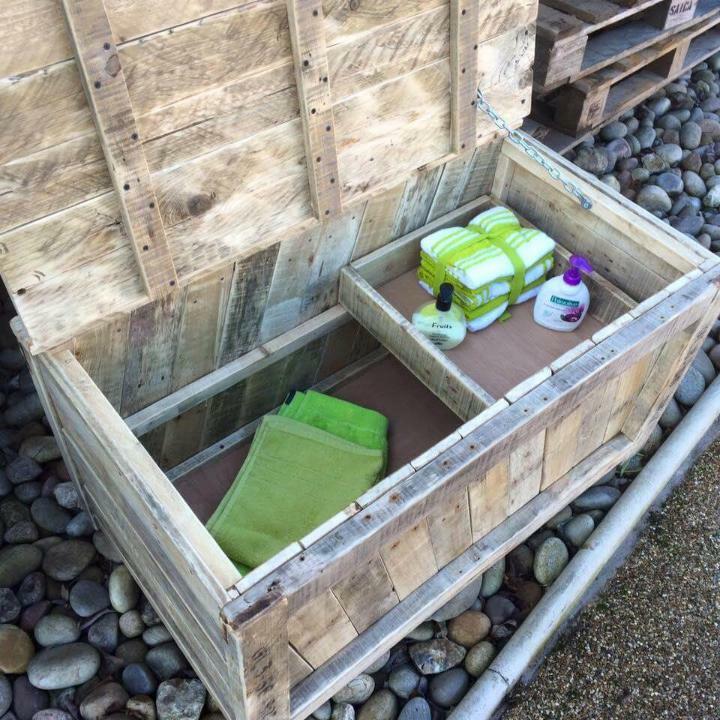 The pallet chest has been built with the pallet slats pieces, packed tightly to each other forming the storage box and the lid. 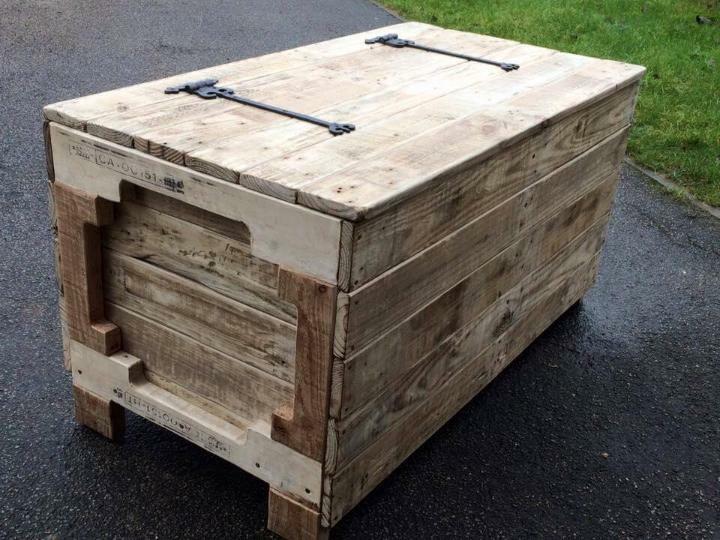 Metal hinges have been used to support the lid with the box and hence making your storage safer. If you want to store more than one item in the chest you can make compartments using the diving shelves. 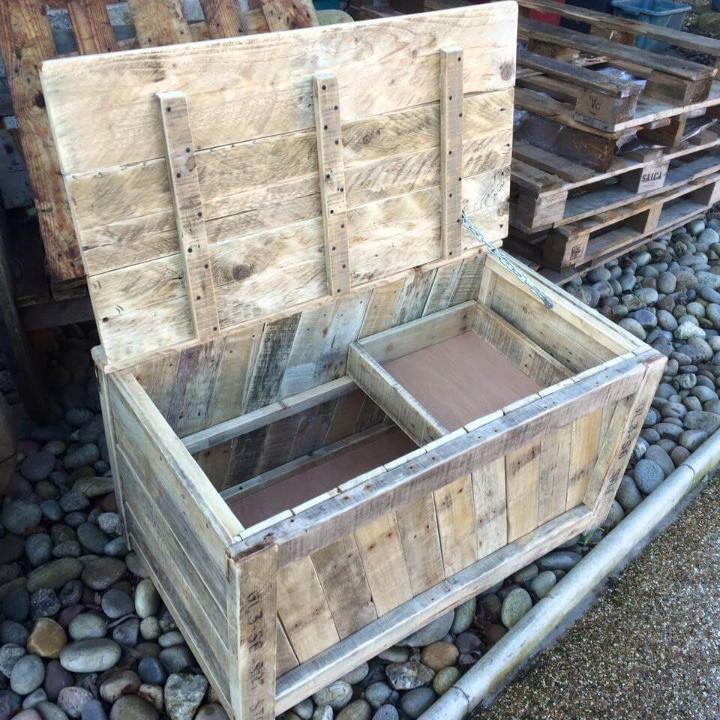 Pallet chests are the best projects to get your hands dirty with as they are capable of a huge storage and being made up from the free pallets you can shape this chest up and that too at free cost. 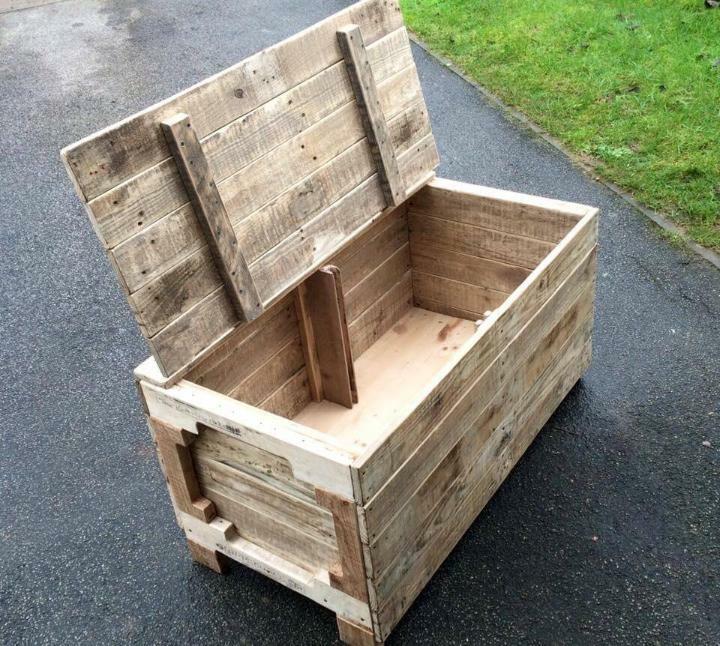 The chest has been built with a lid making your storage items safe and the lifting the lid up a huge storage space is revealed allowing you to hide a lot of stuff in it that is scattered in your whole house. 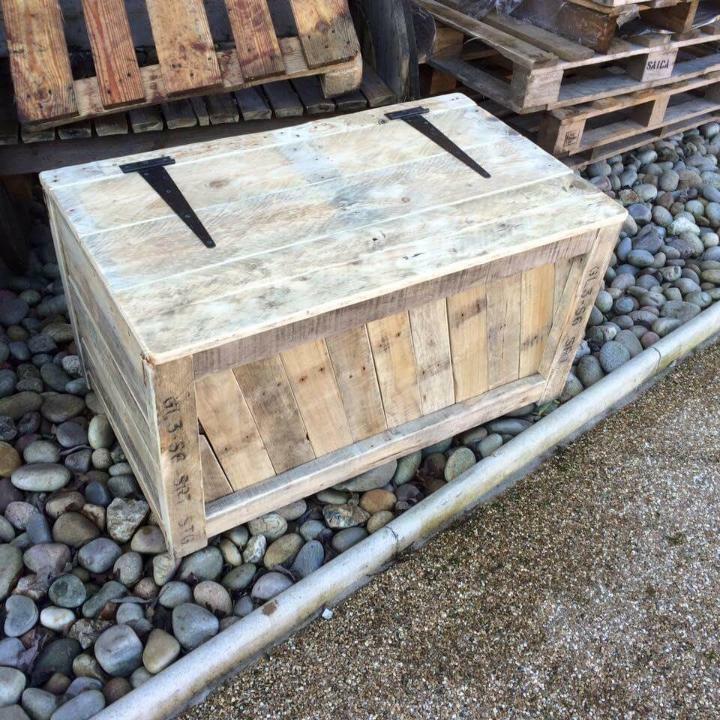 The whole set up of the chest has been shaped up from the pallet slat pieces of wide and thin size, packed tightly for a compact structure.A chain hinge has been used to support the lid with the chest so that it does not fall back when opened. You can further make this chest more useful for your storage use by making sections in it for different things to be hidden in it and shelve like structure can be used as the divider and the item holders. Metal hinges have been used to support the lid with the outer structure of the chest. It has been sanded well but not stained when finished so that it adds a rustic and natural appeal to your home decor and interiors.